Ten years ago, the Pew Research Center was established by The Pew Charitable Trusts to bring together several of Pew’s information initiatives. The new organization had a unique mission to offer nonpartisan, non-advocacy information to decision-makers and the public. The Center has amassed a large body of work over the past decade. For our tenth anniversary, here’s a look back at some of our most important findings. 1What does the American political landscape look like? Our long-standing work on political attitudes has tracked a growing ideological division between Republicans and Democrats. 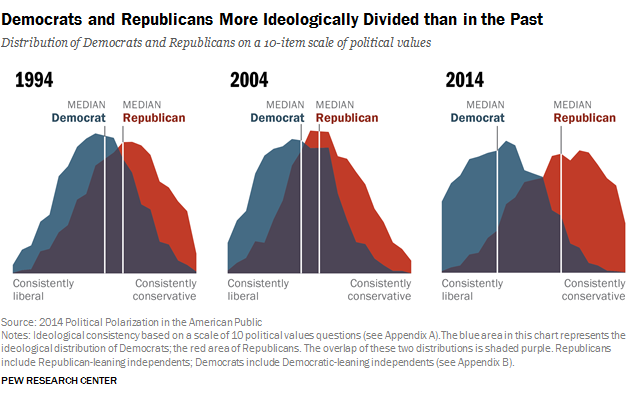 This year, our largest political survey ever revealed the two parties are more divided along ideological lines – and partisan animosity is greater – than at any point in the last two decades. This division and rancor is strongest among those who are the most engaged in the political process. And these differences influence our daily lives, including where we want to live, the kinds of neighbors we want to have and whom we would welcome into our families. Our 2014 political typology survey divided the American public up into cohesive ideological groups based on their attitudes and political values. Curious about where you belong? Take our quiz to find out. 2Who are the Millennials? One of our best-known studies was our 2010 report on the Millennials that described a generation of young adults who were confident, digitally connected and open to social change. 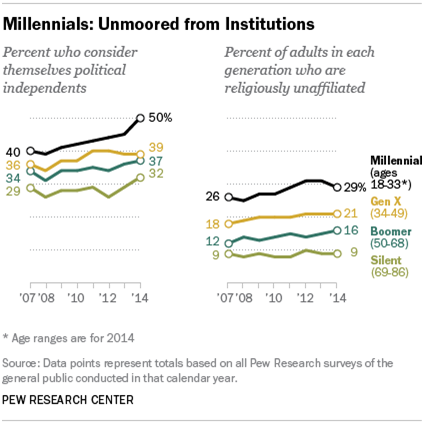 We revisited Millennials this year, and found they are relatively unattached to organized politics and some core social institutions, like marriage and religion. Despite low levels of social trust and heavy debt burdens, they are optimistic about the future. 3What does the world think about _____? 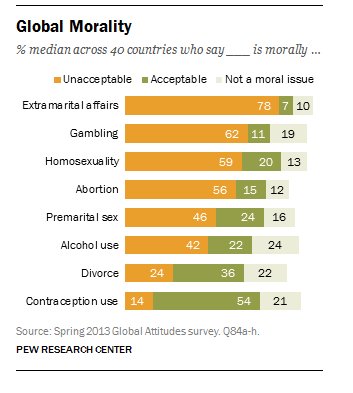 We have conducted nearly 400,000 interviews in 63 countries as part of our Global Attitudes survey, examining the biggest topics of the day, ranging from the economy and the values gap between U.S. and Europe, to Islamic extremism and what is morally acceptable in different countries around the world. We’ve found a shift in global perceptions of the balance of power between the U.S. and China: Majorities or pluralities in most countries surveyed this year say China either has surpassed or will surpass the U.S. as the world’s leading superpower, though more still say that the U.S. is the world’s leading economy. America’s image abroad is also changing. There is widespread global opposition to U.S. eavesdropping and drone use and a decline in the view that the U.S. respects the personal freedoms of its people. 4How is religion changing in America and around the world? Since 2007 we’ve been closely tracking the percentage of U.S. adults who don’t identify with any religion. One-in-five Americans – and a third of adults under 30 – now fit this category. Americans, as a whole, are ambivalent about the trend: About half say that having “more people who are not religious” is bad for society, while the other half say it’s either “a good thing” or doesn’t matter. The rise of the “nones” is evident even among minority groups such as U.S. Hispanic adults, nearly a quarter of whom (24%) are former Catholics who now identify mostly as Protestants or as unaffiliated. 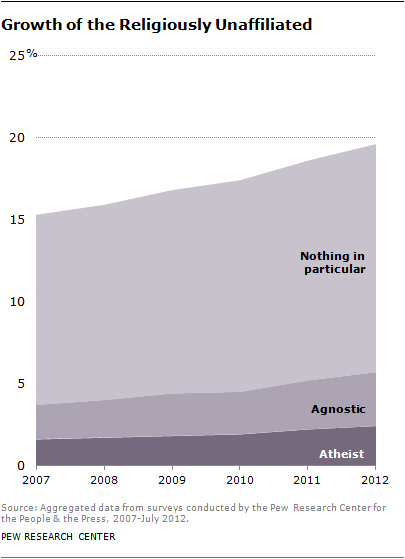 Overall, our surveys show that religious affiliation in the U.S. is remarkably fluid. More than a quarter of the 35,000 American adults we interviewed in a massive 2007 survey had left the religious tradition in which they were raised in favor of another religion or no religion at all. Yet the United States remains a highly religious country with a sizeable Christian majority and, by global standards, a relatively low level of religious diversity. Around the world, about 5.8 billion people, or more than 80% of the Earth’s population, identified with some religion as of 2010, according to our demographic analysis of censuses and surveys in more than 230 countries and territories. Overall, Christians accounted for about a third of the world’s population (32%), and Muslims made up nearly a quarter (23%). Our cross-national survey of more than 38,000 Muslims in 39 countries found that many would like sharia – traditional Islamic law – to be recognized as the official law of their country, but they vary widely in their views on exactly what sharia entails. 5How is the American family changing? 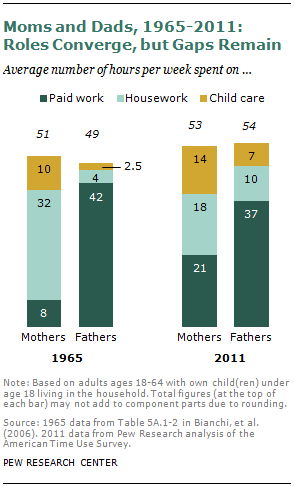 The roles of moms and dads have converged over the past 50 years, as dads took on more housework and child care while more mothers joined the workforce. There has also been a long-term rise in the share of households in which mothers are the sole or primary breadwinner. More than a third of these households are headed by married mothers who have a higher income than their husbands, while 63% are headed by single mothers. At the same time, the share of households with stay-at-home moms has ticked up in recent years after decades of decline, while the number of stay-at-home fathers (while still small) has nearly doubled since 1989. The number of multi-generational households has also doubled since 1980; young adults (ages 25 to 34) have been a major component of this growth, especially since 2010. 6What is the state of American journalism? We have been studying the American news media for over a decade, following the industry through a tumultuous time as the rise of the internet upended a decades-old business model. This year’s State of the News Media report (the 11th edition) found new optimism in the industry due to the arrival of new digital players, the growth of new revenue streams and more evidence than ever that news is a part of the explosion of social media and mobile devices. 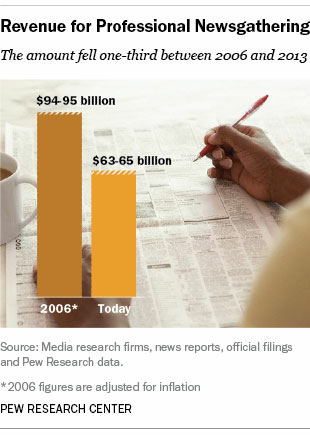 But there’s also been a severe loss of jobs — particularly in newspaper newsrooms — and total revenue supporting American journalism has declined by one-third since 2006. 7How is the face of America changing? Overall, more than 40 million immigrants live in the U.S., more than in any other country worldwide. The nation’s demographics are changing in other ways too. Nearly half of babies born in the U.S. today are a racial or ethnic minority, and Hispanics are the largest U.S. minority group, comprising 17% of the U.S. population. Our Hispanic Trends Project is well known for its work tracking the huge rise in the U.S. unauthorized immigrant population. Our most recent estimate found this growth is tapering off: 11.3 million unauthorized immigrants were living in the U.S. in 2013, about the same as in 2012 and 2009. As the nation becomes more racially diverse, its population is also aging, though not as rapidly as the populations of some other countries. Both of these trends mean that, by 2060, America will look very different: Our population will be majority non-white and our median age will edge above 40 — both major demographic milestones. A new book, “The Next America,” by Pew Research Center’s Paul Taylor, and an accompanying interactive essay, explains how these demographic changes have, and will, impact our politics, social values and economy. 8How have the U.S. wars of the past decade changed America and the world? The Iraq war damaged America’s global reputation during the Bush years, but the U.S. image improved markedly when Barack Obama took office. Our recent research has found evidence of war fatigue among the American public. Our 2013 survey found that, for the first time in 40 years of polling, a majority of Americans believed the U.S. plays a less important and powerful role as a world leader than it did a decade ago. In that survey, conducted before sentiment began to shift following the current crises in the Middle East and Ukraine, an increasing number of Americans wanted the U.S. to mind its own business internationally. We also explored the toll U.S. involvement in the post 9/11 wars took on the nation’s veterans. As the conflicts in Iraq and Afghanistan were winding down in 2011, a survey of veterans found that they were overwhelmingly proud of their service, which most said helped them to get ahead in life. But many (44%) also said readjustment to civilian life was difficult, and 84% said that the general public did not understand the problems faced by those in the military. 9Who are the ______? Occasionally, we zoom in from our general population surveys to more deeply examine the attitudes and demographics of specific, harder to reach, populations. In 2012, we surveyed Asian Americans and found, they are more satisfied, overall, than the general public with their lives, finances and the direction of the country. Last year, when we surveyed LGBT Americans, we learned 92% believe society has become more accepting of them in the past decade, while at the same time perceptions of discrimination persist. Also in 2013, we surveyed Jewish Americans and found they overwhelmingly say they are proud of their Jewish identity, but roughly one-in-five Jewish adults (22%) describe themselves, religiously, as atheist, agnostic or nothing in particular. 10How has the internet changed society? And what will its impact be in the future? Our research on the evolution of digital life for 15 years has tracked skyrocketing adoption rates for broadband, mobile and social media, and studied how the internet has changed our political engagement, civic discussion, dating and social ties, as well as how we manage our health. Technology has transformed our lives around digital networks, as chronicled in research director Lee Rainie’s book, “Networked,” co-authored with professor Barry Wellman in 2012. The project has also paid special attention to the online life of key groups ranging from teens to senior citizens and it has done research informing key policy debates, such as those swirling around privacy. What does the future hold? In our series of reports marking the 25th anniversary of the World Wide Web, experts foresee an internet that will flow through people’s lives like electricity and many predict that the rise of embedded and wearable computing will help the internet of things to thrive by 2025. The American public, meanwhile, believes the next 50 years will be a period of profound scientific change, as inventions in the realm of science fiction move toward reality.